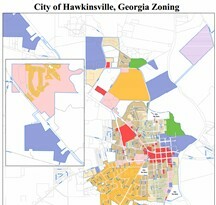 As of June, 2010, the City of Hawkinsville now has a complete new set of ZONING MAPS. The maps were produced by the Regional Commission for the city. Prior to these maps, if a person wanted to know what a particular parcel was zoned – good luck. You had to find the 30 year old zoning map and then go through years and years worth of zoning board minutes to see if it had ever been rezoned. It was ridiculous. Now, codes enforcement officer, Keith Carter, has the maps (along with city hall) and is diligent about keeping the maps current. Although I have a lot of libertarian thoughts rattling in my head, I do believe that zoning laws are good. They help us manage our growth and have planned improvements in designated areas. It helps to protect property values of adjoining properties. It allows one to feel confident about the neighborhood or community in which they are investing their dollars. The county has also followed suit and we know have zoning throughout Pulaski County as well.